Official Football Team in UoITC Participation in Iraqi Universities Championship for Closed Stadiums Football . 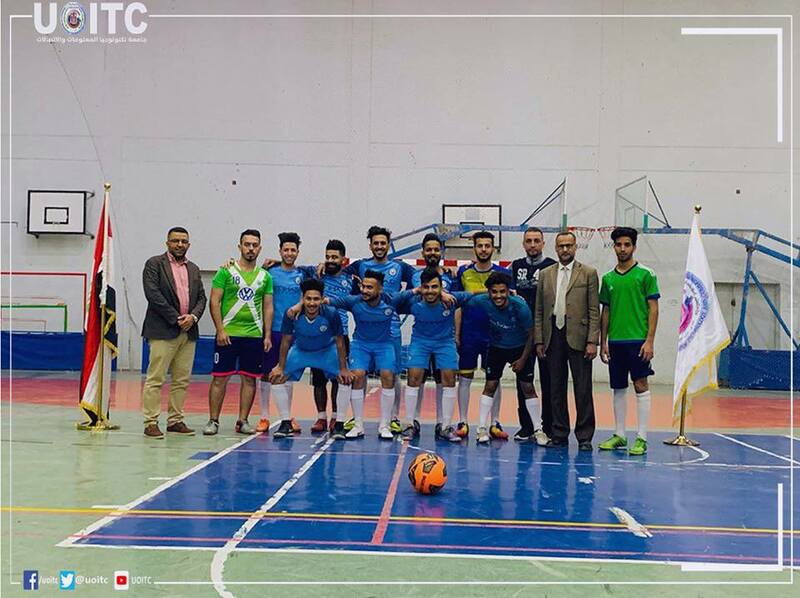 Official Football Team in UoITC Participation in Iraqi Universities Championship for Closed Stadiums Football The university’s football team has participated in Iraqi universities championship for closed stadiums football in the fourth group matches. The matches took place in the closed stadium in College of Elementary Education – Al Mustansiriya University, under the arrangement of Department of Students’ Activities in The Supervision and Scientific Education Office, in cooperation with AlMustansiriya University, Al Nosour College University and Al Farahidi University, where the competition was among most governmental and private universities. The university’s team was headed by Dr. Emad Kadhem AlKaabi, head of Students Activities Section, along with Mr. Falah Hasan as a Supervisor, Mr. Yasser Amer as an admin and Mr. Hayder Zaid as a trainer. The matches took place on within 5 days in different morning and noon timing, and the university’s team was unlucky to qualify to higher stages.